In previous versions, to geotag a photo you needed to manually enable it (tapping the checkmark below the caption), then optionally adding a name to the location. This location would then be shown below your username in the photo view. If you didn’t add a name to the location, nothing would be shown in the photo view, as if the photo wasn’t geotagged. Most people simply left this checkmark always on, just adding the location name when they wanted it to be visible. What wasn’t clear before is that Instagram would send the photo location whenever that checkmark was green, even if you didn’t name the location. It didn’t make much difference before because there was no way of seeing that info in the photo, but that changed in the new version. If you’re not careful when reviewing your photos before adding them to the Photo Map, all these geotagged photos will be shown with their exact location in your map. If you are NOT connected to Wi-Fi or 3G when taking photos, your location information will not be stored with your photos for later uploading. What they didn’t mention is that if you took the picture in a place with no connection, but left the green checkmark on while uploading the photo later, Instagram would send your current location when uploading as the photo’s location. I have a couple of friends that like to take pictures through the day, but will only send them to Instagram later, when they’re home. I checked their Photo Maps and could easily find a lot of photos tagged with the same location: their home address. Instagram modified that screen in the new version, making it more obvious when you’re adding a location to your photo, even if you don’t name the location. But it’s still not clear that you’re adding your current location if the photo doesn’t have one embedded. 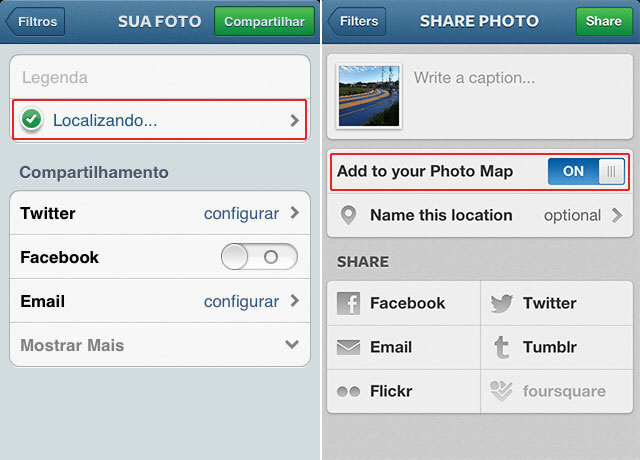 All photos that were sent to Instagram with the green checkmark on will be visible on your map with their exact location, unless you manually remove them from the map. Photos that were sent with a custom location (shown in gray in the photo view) will also be visible on your map with their exact location. Photos without location info embedded (taken in a place with no internet connection or modified by an app that removes location info, for example) sent to Instagram with the green checkmark on will be visible on your map with the exact location that you were when uploading them. This includes photos with a custom location (shown in gray in the photo view). Photos that were sent with a specific location (selected from the list, shown in blue in the photo view) will be visible on your map with that specific location, no matter where you were when uploading. The Photo Map is a great new feature (specially if you travel a lot) and you should not be afraid to use it. Just be sure to understand how it works and remove from your map photos that were geotagged with a location that you’d rather keep private.